I was working with a talented team of sales professionals in a discussion about selling on value over price. One of the team members asked a great question, “So at which point does it make sense for us to offer a discount to win the business?” Whereas most people would not be comfortable asking this type of question, it was clearly an issue on everyone’s mind. In fact, I’m guessing you might be wondering the same thing. In Same Side Selling, Jack Quarles and I spend a fair amount of time discussing adversarial traps that put the buyer and seller on opposite sides of a transaction. Price is one of those traps. The buyer has a responsibility to her company or organization to purchase as much value as she can at the lowest possible price. Though Jack (an expert buyer) would argue that a smart company’s goal should be to get the most value per invested dollar (and I would agree). Unfortunately many confuse that goal with the task of finding the lowest price. When the buyer says that you have to offer a lower price “in order to win the business,” it is easy to fall into that trap. However, do you think that the customer sees poor value at your current price, but will love the solution if it was 10% less? Not likely. Though they would love to pay a bit less, in most cases it is not because they don’t see value. Rather, their desire to pay less is because countless salespeople before you demonstrated the price can be lowered if the buyer simply asks for it. The buyer who sees value at 90% of your rate, will see it at 100%, too… if you are patient and focus on value. My answer to the sales superstar (for real – a top performer) was that he should always lower his price anytime he feels the value he is delivering per invested dollar is less than the price the customer is paying or could pay elsewhere. So, if he is selling a commodity, then he might have to match other commodity sellers. The good news is that he, like most of you, do not sell a commodity. Rather, you have threads of differentiation that you can cling to and help the buyer realize why they will receive a better return per invested dollar with you than with alternatives. In more than 99% of the cases, they answer B) The vendor who best understands their situation. You might say they are all hypocrites. Isn’t it ironic that as sellers executives think that price matters most, and as buyers price is less important. When have you thought you needed to discount only to discover the client moved forward anyhow? 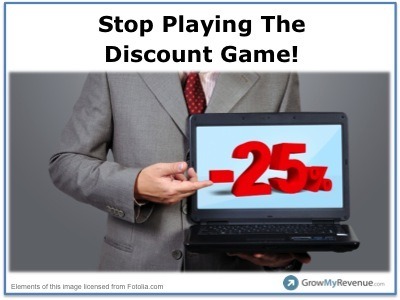 When has discounting COST YOU the deal? Have you ever decided not to buy because the vendor dropped the price? Why?